A symbol is an object or sign that is used to represent a product or an idea. Symbols are not important in themselves, but rather because of what they represent. A Christian symbol is not something of value in itself – to be worshiped as an object—but rather, its real value comes from what it does to lift our minds and lives to what the symbol stands for. Part of the beauty of holiness to be experienced by the worshiper at West Heights will be found in the symbolism that was built into the sanctuary. The actual shape of the sanctuary is in the form of a cross with the choir loft and nave resembling the shaft of the cross, and the chapel and Gallery West becoming the arms of the cross. 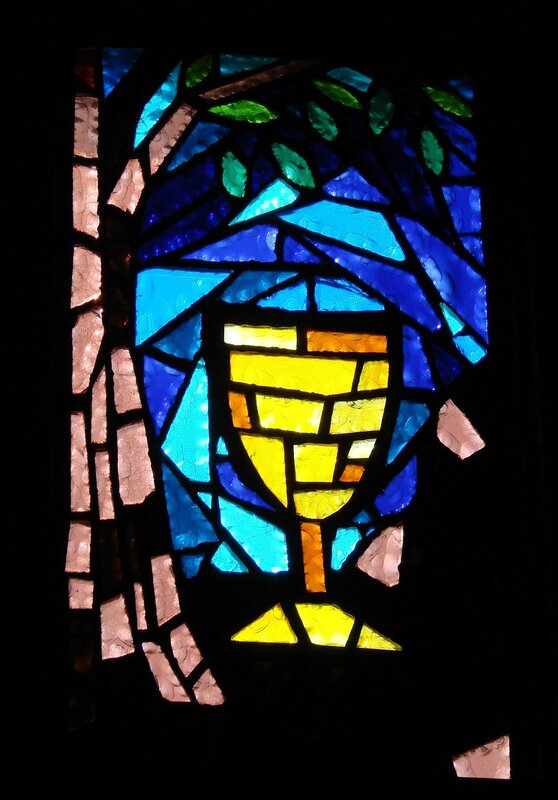 The symbols in this window are the olive tree and the chalice. This symbolizes that time just prior to His crucifixion when Jesus went into the Garden of Gethsemane. There he agonized about whether he would proceed on the course His life in God was taking him. The Bible says he fervently prayed, “Father, if it is possible, let this cup pass from me, but not my will but thine be done”. This moment in Christ’s life has been referred to as the greatest decision He had to make. Conspicuous by its size and location is the great freestanding stone ALTAR, designed so that people can gather around it as the center of sacrifice. The two United Methodist sacraments, Baptism and Holy Communion, are keys to this area’s use. 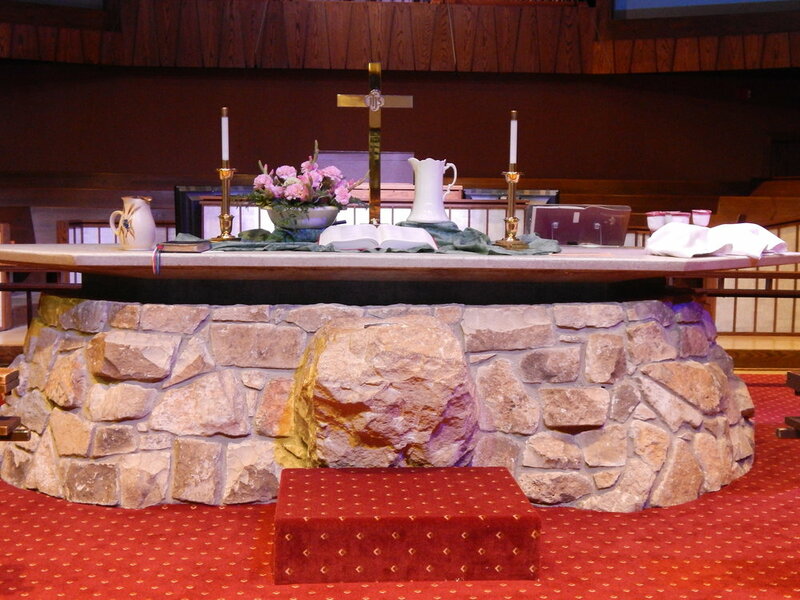 The Baptismal Font is attached to the front of the altar and the communion rail extends around the altar so that the participants can become “a family of God gathered around the Lord’s table”. Towering above the altar is the CROSS. In general, Protestant Christians use the symbol of an empty cross. Our particular cross was designed as a bejeweled jubilee cross, a symbol bursting with the message, “He has risen, Hallelujah.” Thus the cross, usually a symbol of punishment and shame, became a symbol of triumph and glory. The first long window was designed to symbolize how God’s message works through HUMANKIND. In the lower part is a human figure reaching upward. God speaks to us through our bodies. Immediately above and behind this figure is another figure with a color purple. This symbolizes the mind. Above these two figures are the artistic lines to symbolize Spirit, descending upon humankind. This window’s theme was chosen to remind us that the messages we get during worship reach us through body, mind, and spirit. The symbols in this window were chosen to show that what we do is a reflection of how we think, act and portray the highest attributes of life. The uppermost symbol is an atom – the smallest particle that exists – which is the building block from which the earth and everything on it was created. Below that is a book and a lightened lamp, symbolizing knowledge and enlightenment. Then there are the Caudices, the symbol used by medicine and related healing professions. The flask and other laboratory equipment are used in the scientific professions. Next are three cog wheels, representing industry; intermeshed to symbolize cooperation. At the bottom of the window is a balance scale denoting justice. Intertwined with these symbols is the rope or vine, binding all of them together and reaching upward toward God – the highest goal for all our works. In the lower portion are two keys that are crossed. These represent the statement made to Peter: “I will give you the keys to the kingdom of heaven, and whatever you bind on earth shall be bound in heaven” God gives us the keys of life, to experience the best or the worst, the good or the bad, justice or injustice. Jesus Christ set the example. 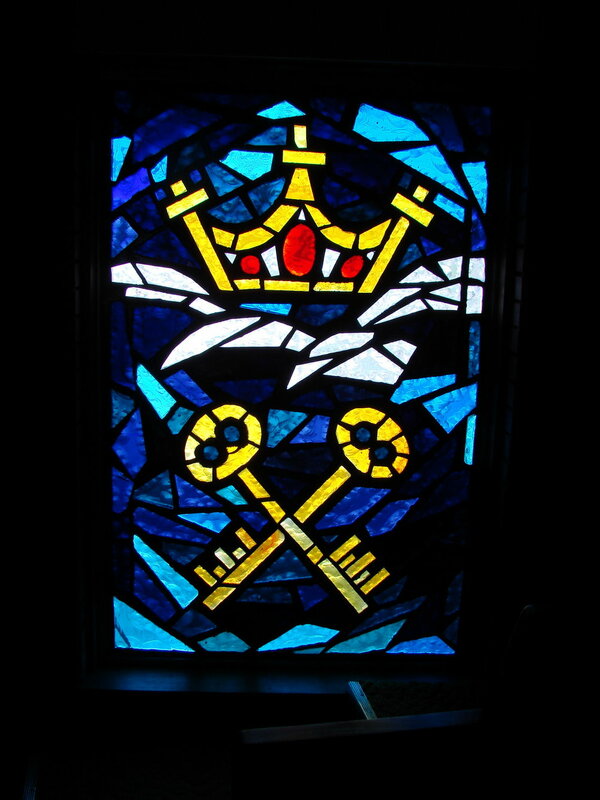 Above these keys are the symbols of the cross and crown. They assure us that if we are faithful to Christ’s teachings we will inherit the crown of life now and in eternity. 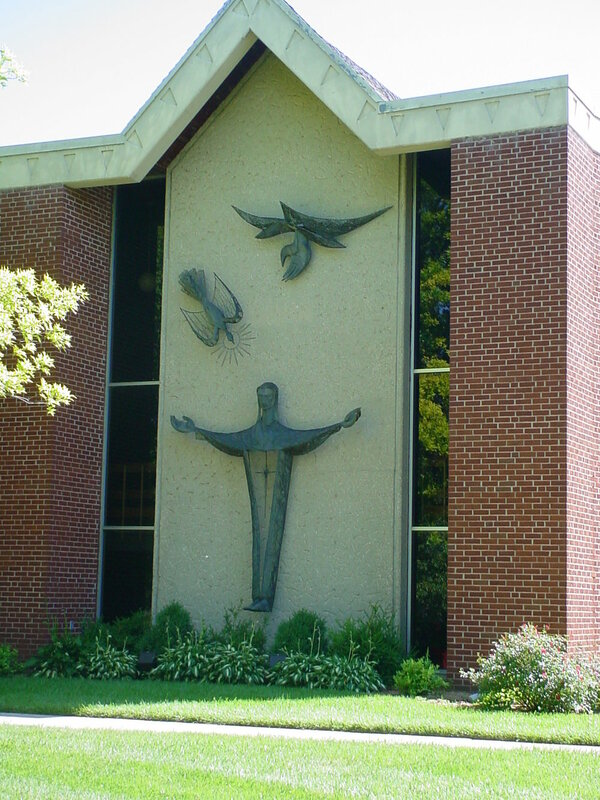 On the outside wall of the east end of the Sanctuary building is an art sculpture arrangement known as the Trilogy. Symbolically represented are: God the Father; God the Son; and God the Holy Spirit. Central to the Trilogy is a figure to represent Jesus Christ with outstretched arms as if inviting anyone who would come to Him. It might well represent Christ’s statement, “And I, if I be lifted up, will draw all to me.” Above, and a little to the right of this figure, is an open hand reaching downward which could be interpreted as expressing, “This is my beloved Son in whom I am well pleased,” and also as God’s open hand extended to us all. Above and a little to the left of the Christ symbol, is a descending dove to represent the Holy Spirit coming down to us all. This Trilogy has become an identifying feature of our church.